Yesterday, Google pulled the trigger and finally launched Chrome for Android in beta. It is undoubtedly one of the most significant app releases ever for the Android platform, but like other platforms, the browser market is a strange beast and BetaNews readers, of all people, should be acutely familiar with that fact. Is it going to do what I need it to do? The Android platform has no perfect browser --insofar as there can be a perfect browser-- and third-party browsers have been crafted to suit specific needs of certain users. There are users who want to have a fast experience on slow connections, there are users who want to block ads, and there are users who never want to see the mobile version of a website, and so on. Each user is likely to use a different browser and frankly, Chrome for Android might not be the answer for them just yet. So rather than give you a generic overview of the new browser, we're going to examine a few general needs for a mobile browser and see whether Chrome for Android answers those needs. Chrome for Android's number one killer feature is its ability to sync with a user's Google account live. If the user has Chrome open on their desktop, they can drop into the "Other Devices" menu, and see all the tabs they have open without having to save anything or consciously send sync commands. The feature is extremely well-done and easy to manipulate. But if you are not a desktop Chrome user, this feature will hold little sway. As of January 2012, Chrome had a third place share of the desktop browser market with 18.94 percent, behind Firefox which had 20.88 percent. Firefox for Android lets users access their desktop browsing history, bookmarks, passwords and open tabs from their mobile device. 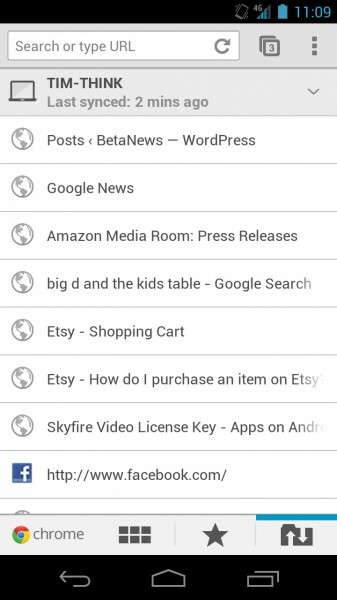 Similarly, Opera Mini and Mobile for Android can also sync tabs, history, and favorites with the Opera Link feature. Syncing with the desktop browser is a widely available feature in third-party browsers, but Google is turning it into a feature deeply ingrained into the user's Google ID, which is a cornerstone of Android control. 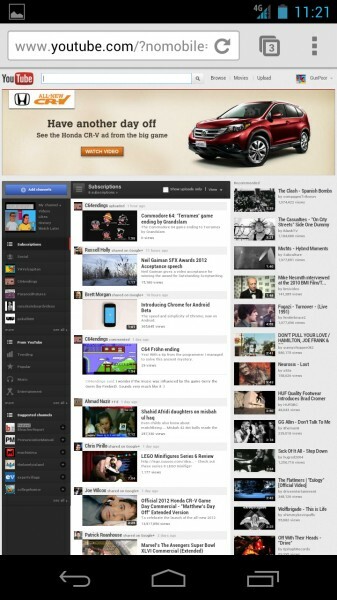 Some users need their mobile browser to default to the full desktop version of a site, others just prefer it that way. The ability to simply change the user agent string with a click of a menu item is a big feature in many Android browsers, such as Dolphin HD, Skyfire, Angel, and Boat. Unfortunately, in the Chrome for Android beta, there's no way to change this setting yet, and sites will default to their mobile version. We've known for at least the last three months that Adobe's Flash Player for mobile is finished. But Flash still carves out a giant presence on the Web, and a browser's inability to handle it guarantees an experience that does not match the desktop. 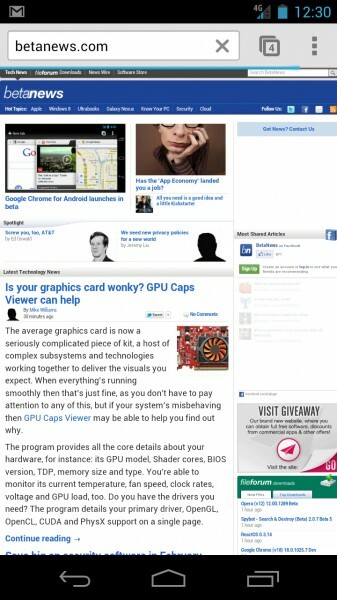 This is one of the areas where Skyfire shines among third-party Android browsers. It offers support for Flash, and for a $2.99 charge, users of Skyfire can have access to the browser's proprietary video optimization technology -- which accelerates the video experience. Chrome for Android lacks support for Flash, and is unlikely to ever receive it. Adobe published a blog confirming the fact that the stock Android browser will continue to have Flash support, but Chrome for Android will not. "Adobe is no longer developing Flash Player for mobile browsers, and thus Chrome for Android Beta does not support Flash content. Flash Player continues to be supported within the current Android browser," Flash Platform product manager Bill Howard said. The desktop version of Chrome has the URI "chrome://downloads" which lets users view, launch, and manage all the content they're downloading through the browser. This is not present yet in the mobile version of Chrome, and download management in the new browser isn't quite up to the levels of Firefox and Skyfire for Android. Chrome and Chrome OS are customizable with a growing library of browser extensions which add specific features to the browser which aren't available by default. Chrome for Android currently lacks extension support as well, and the main browsers for Android that tout this feature are (again) Dolphin HD and Firefox, which have approximately 50 and 110 mobile-specific add-ons respectively. With these, users can customize their experience with capabilities such as Bookmark to SD, Screenshot to SD, Adblock, Personas, and more. Though Chrome for Android is fast, fluid, pretty, and easy to use, it is still far too early to know if it is going to be the "right" browser for any user besides the one who wants to share his desktop Chrome content with his mobile device.